Edinburgh’s famous underground attraction, The Real May King’s Close, is giving visitors an insight into its fascinating architectural history, plus the rare chance to enjoy one of Scotland’s oldest art forms, as part of the first ever Previously… Scotland’s History Festival. 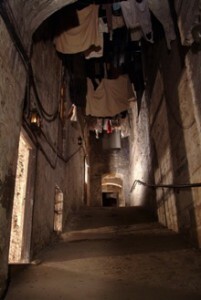 The Real Mary King’s Close is a warren of hidden passages and closes which were covered in 1753 with the building of the Royal Exchange, which is now the City Chambers. The lower floors of the buildings on these closes still remain today, used as foundations for the City Chambers and preserved to allow an insight into what life was like 500 years ago. Guided by an onsite expert, the brand new Architectural History Tours will explore how these buildings have changed through the years. Tours depart at 6.30pm and 8pm on Monday 21 and Sunday 27 November. 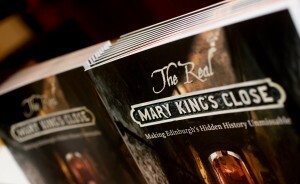 Nigel Hosier, general manager of The Real Mary King’s Close attraction, commented: “It’s fantastic to be involved in this exciting new festival that has been created to bring our history out into the streets. Visitors often express an interest in the buildings within The Real Mary King’s Close, so we decided to host two evenings of hidden architectural history as part of the festival. The Flyting is an insulting yet artistic face-off between two poets. Deep within the Close, two of Scotland’s most quick witted comedians and actors, Stuart Murphy and Garry Dobson, will bring The Flyting of Dunbar and Kennedy of 1504, which was originally performed in front of King James IV, into the 21stcentury in a battle of wit, learning and foul language. Previously… Scotland’s History Festival will host 200 events throughout Edinburgh between 17 and 30 November, bringing the history made by Scotland’s people closer to Scotland’s people. To book tickets for the special events at The Real Mary Kings Close please call 0845 070 6244, places are limited so pre-booking is essential. To find out more about Previously… Scotland’s History Festival please visit www.historyfest.co.uk.